The Senators have just 10 games left in the 2018-19 season, and for many fans, the end of this season will be welcomed with open arms. However, that won’t be because of this week. Despite losing their first game this week 3-2 against the Philadelphia Flyers, the Senators bounced back with back-to-back statement wins. They shut out the St. Louis Blues 2-0 and defeated the Toronto Maple Leafs 6-2. While they’re still in the NHL’s basement, the team has shown it still has some fight left. On March 12, the Senators announced that they signed U.S. college free agent Max Veronneau to a two-year entry-level deal. The right winger won’t be wasting any time, making the jump straight to the NHL with the Senators. He is signing with his hometown team, as a native of Ottawa. He was highly sought after by NHL teams with his season ending with the NCAA’s Princeton University Tigers. It was reported that as many as 25 teams expressed interest in signing the free agent. Veronneau is a consecutive season Hobey Baker nominee, who has put up 144 points in 130 games with the Tigers. Before heading to college, the 23-year-old played for the CCHL’s Gloucester Rangers, where he recorded 119 points over 92 games. He also attended the Vegas Golden Knights development camp in 2017, while attending camps with both the New Jersey Devils and Los Angeles Kings in 2018. While NCAA free agents have been very hit or miss in the past, Veronneau should get a very good look from the Senators, and if he can bring the success he had at Princeton, he could be a big piece of the team’s rebuild. In his first two NHL games, he has shown flashes of what’s to come with his speed while chipping in one assist in his second game. Thomas Chabot has been one of the few bright spots on the Senators this season. Although he trailed off over the last month, Chabot still leads the team in points this season with 49 in 62 games. He’s also tied for the lead in assists (36) and power-play points (13), and is second in goals (13). His impressive sophomore season might be done, though, as a broken toe has him week-to-week with not much left to go. The injury came when he blocked a shot against the Flyers. This was a breakout season for Chabot and saw him earn an All-Star nod for the first time in his young career. There might still be a chance to see him play before the 2019-20 season, though, with the World Championships kicking off in May. The 22-year-old played for Canada in the tournament last year, where he had one assist through six games. He also represented Canada at the World Junior Championships in 2016 and 2017. His second tour with the team saw him win a silver medal and he was named tournament MVP, collecting four goals and 10 points through seven games. Coming back from the Golden Knights in the Mark Stone trade, defenseman Erik Brannstrom comes to Ottawa with a ton of hype to his name. Getting his first NHL game against the Blues, Senators fans got a glimpse at the future of the defence corps and the future looks bright. As an emergency call-up, Brannstrom was sent back down to the AHL after the game, but it’s a good start for the young player. The 19-year-old played 17:20 and was a plus-one in the 2-0 victory. He took over the Senators back end, leading rushes and jumping up into the play. 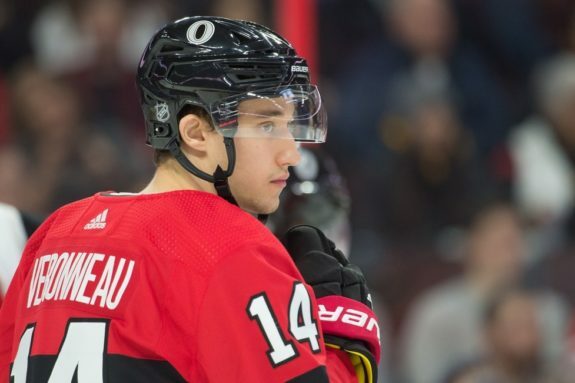 Imagining Brannstrom and Chabot both in the lineup, along with Christian Wolanin and Maxime Lajoie paints a very promising picture of the back end for Ottawa. “Everyone is smarter, they think more out there,” Brannstrom said after his debut. “The speed is almost the same, but the way guys make plays is totally different. You’re playing with better players.” (From: “Hello and goodbye: Brannstrom returns to Belleville after promising debut” – Ottawa Sun – Mar. 15, 2019). 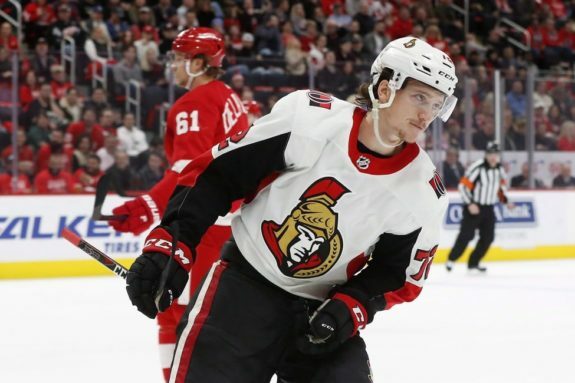 The Swedish player will be a significant part of the Belleville Senators’ playoff run and has already started to settle in with his new team. In Sunday’s win versus the Laval Rocket, he tallied three assists. He has only four assists through seven games, but it’s just part of playing on a new team. The Senators have a Canadian west coast trip this week, facing off against the Vancouver Canucks, Calgary Flames and Edmonton Oilers. Also, Belleville plays three games this week, as well, including a very important match on Wednesday versus the Utica Comets. Belleville currently holds the final playoff spot in the North Division, with four points above the Comets and the Cleveland Monsters.